Monel resembles stainless steel but is an alloy of Nickel and Copper. Probably the easiest method of telling stainless steel from Monel is the spark test. Stainless steel will create sparks when placed against a grinding wheel. Monel (and most nickel alloys) are "non-sparking"
Monel wire is used by deep sea fisherman as a trolling, seizing and baiting wire because it can be rolled and bent many times without breaking - unlike stainless wire. And its extra softness makes it easier to use. Monel safety wire was used exclusively on the Titan II rocket engine (picture below is from a Titan II). Given that the operational life was 3 1/2 minutes for this first stage engine one wonders why safety wire was even needed. Monel is used in potentially explosive-atmospheres where the materials must not be capable of sparking. 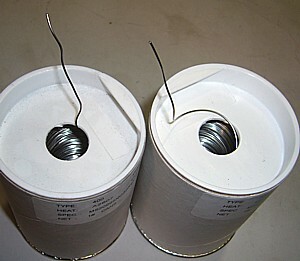 An example is using monel safety wire in an aircraft fuel tank instead of stainless steel safety wire. Reference Boeing-767 AD-2006-08-04. Although, stainless steel has lower potential to spark from friction than a tool steel, Monel is even better. 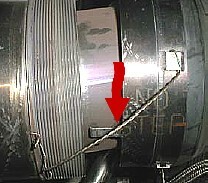 In the picture above, the long unsupported gap between safety wire ends and engine vibration may cause the wire to resonate and fatigue fail. Monel safety wire, with its better toughness and fatigue strength, is a better choice than standard safety wire in this application. In this picture the stainless steel safety-wire-fatigue-failure caused a forced landing Airbus-A330-301. 1. The V-band clamp unwound when the safety wire broke and this resulted in 600 degree C. hot air to enter the engine compartment setting off the fire detection system. Nitric-acid turns metal blue-green. Steel rod rubbed in solution will turn copper colored. Non-magnetic - magnet will not stick. Monel is magnetic whereas "K" monel is non magnetic Stainless Steel and Monel safety wire look almost identical. If you take a piece of wire and hold it to a grinding wheel, the stainless steel will spark and the monel won't. Monel is used in high-temperature areas such as on the exhaust. Monel 400 melts at 2,600 degrees F.
Monel is used for locations where you don't want a spark, such as inside fuel tanks. Monel resists breakage when bent or vibrated much better than stainless. Monel is an excellent general purpose wire and better then stainless steel as it will bend more without breaking. This make Monel re-usable. Monel is also a little bit softer so is easier to work with your hands. Where can Monel safety wire be purchased?